QUESTIONS OF WEIGHT are always pertinent in the RV world. 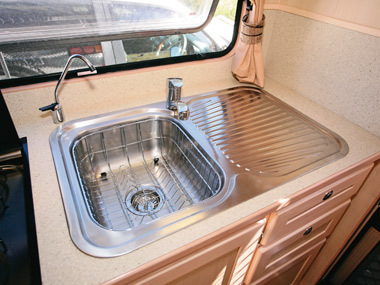 Manufacturers have been fitting more and more appliances and accessories into caravans, while at the same time further engineering them so they can go more places. As one industry source mentioned to me a while ago, "At this rate, we are all going to need to be driving LandCruisers". That said, several caravan manufacturers have been taking a hard look at the weight issue and, more importantly, doing something about it. 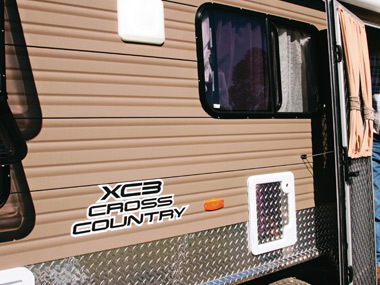 This is why Kedron's Glen Gall is so excited about his company's Cross Country XC3. 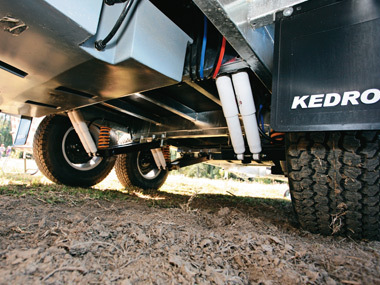 "We've recognised the need for an offroad caravan that's not going to be used to extremes and can be towed by a mid-sized tow vehicle, like a Prado," he said. 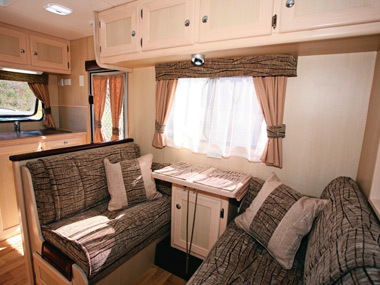 "We've redesigned the chassis, used lighter timber for the cabinetry and lowered the height. We have also installed a three-way fridge to cut down on the solar panels and batteries required." Glen was also keen to point out that strength-maintaining features, such as V-nailing the cabinets and positive locking marine grade catches, had been retained. To prove his point, Glen hitched up a Toyota Prado and I was off on my travels. I don't think it's a coincidence the ATM of the XC3 just happens to match the Prado's towing capacity of 2500kg. And the 3L 127kW/410Nm turbodiesel delivered the goods in terms of power output, while the five-speed auto gearbox meant that towing the van wasn't a hardship at all. 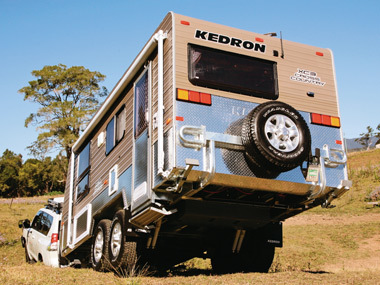 Like the rest of the Kedron fleet, the XC3 is built on a hot-dipped galvanised 150mm railed chassis. It rides on trailing arm coil spring suspension fitted with dual shock absorbers. Up front, a 3500kg McHitch coupling well and truly keeps the van on the tow ball. Two water tanks are fitted between the chassis rails: 100L for everyday use and 60L for drinking. To keep the body rigid, an aluminium interlocked frame with high tensile steel rivets is used everywhere except the roof, where the frame is welded. In case you are wondering, the eye-catching colour of the aluminium cladding is called "Jasper". All of the usual features, such as Camec security doors and tinted acrylic hopper windows (except for the slider beside the door), are fitted, as are two 9kg gas cylinders, jerry can holder and mesh stone protector for the drawbar. Additional stone protection is provided by alloy checkerplate three-quarters of the way up the front wall, plus a zipped vinyl protector across the front window. One of the key weight-saving features on the XC3 is the lack of a conventional front boot. 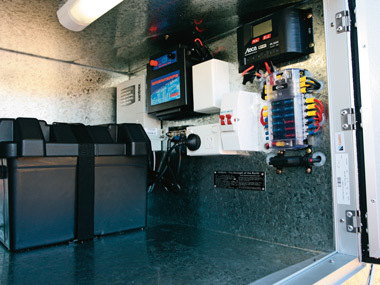 Instead, the van features a three-quarter tunnel boot, which houses the 120Ah battery, as well as the 240V and 12V electrical controls. The XC3's 5.7m (18ft 8in) external length means a layout featuring a rear entry with a split rear kitchen, bathroom cubicle in the rear offside corner, nearside cafe-style dinette and front bedroom. Having the kitchen across the bathroom may not be to everyone's tastes, but it does mean a decent area for food preparation. 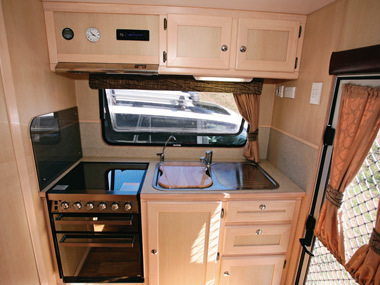 A Smev four-burner cooktop, grill and oven, and a stainless steel sink avec drainer are fitted into the rear bench. Two overhead lockers, two cupboards and a couple of drawers supply the storage space. A clock and radio/CD player are mounted above the cooktop fume extractor. A raised Thetford 184L fridge, with a small floor locker underneath, adjoins the bathroom cubicle on the offside, leaving enough room for good bench space, plus two drawers and several cupboards. Part of larger cupboard space is taken by the 23L Suburban water heater. Two lockers and the microwave are located above. 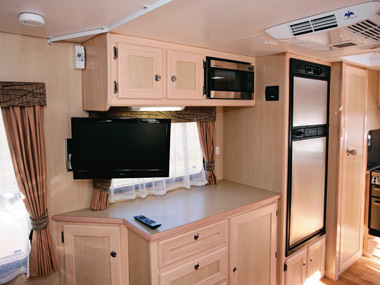 The top of the forward end of the bench is the mounting point for a 19in flatscreen TV, which can be seen from the bed and the dinette. The cafe-style dinette is quite a simple item, designed in the contemporary style with two seats and a tri-fold table, plus a cupboard underneath. There are the usual under-seat storage doors and overhead lockers. 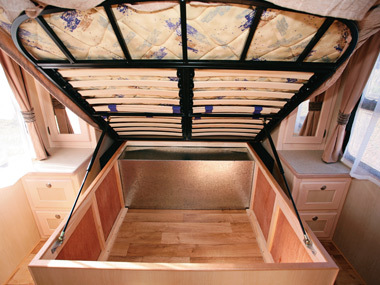 Mounted on a posture slat bed base that allows storage underneath, the inner spring mattress is surrounded by wardrobes, lockers and bedside cabinets. Given the tunnel boot, the cabinets are a little further out than usual. 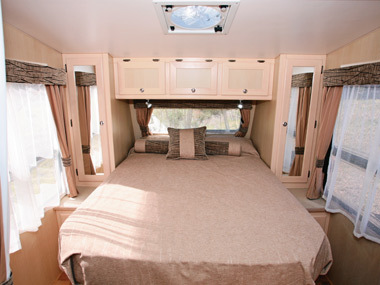 Walk-around space should be more than adequate for most people, while windows all-round and a ceiling-mounted Fiamma fan ensure good natural light and ventilation. A look over this van makes it clear the Kedron team has done its homework in designing the Cross Country XC3. Anyone familiar with their Gall Boys videos will know their practical experience is often learned the hard way. The highlight of the XC3 is that it is built with all the usual Kedron features, yet designed for those who don't wish to drive exclusively on 4WD-only roads. And it is designed to be easily towed by a Toyota Prado - an excellent tow vehicle in its own right. 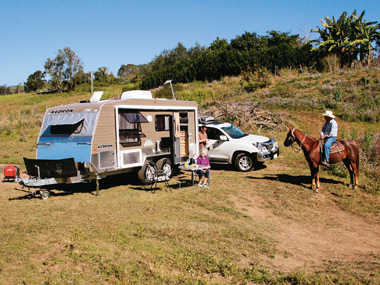 Source: Caravan World Oct 2011.